I went to visit my friendMeg's Blog and landed in the middle of a blog hop...so I decided to join in on the fun. The ladies were making cards for Bella and Monique. Here are the ones I made. I thought the groovy paper would be perfect for a little girl who needed a smile..I added two charms to it and stickers for her name. Monique has cancer so her card is pink...they are both in my thoughts and prayers. 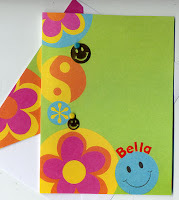 Super cute cards, thanks for sending them to Bella! 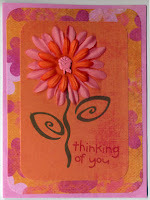 I have some great news for you- you are the random winner from my blog of the digi stamps from The Stamping Boutique! Shoot me an email at micahzane@yahoo.com so I can send them over to you!